The word conservatory conjures up all sorts of images. A school or room for music, for example, as in the New England Conservatory of Music in Boston. Indoor botanical gardens, such as those in San Antonio and Cincinnati and at Longwood Gardens, also are known as conservatories. And let's not forget the formula English mystery: "I say, Ainsworth, Lord Mumblypegg has just been found dead in the conservatory!" These days, however, the conservatory has become a synonym for a sunfilled center of attention, whether or not the room has a Steinway, a potted palm or a lifeless body. These rooms-a much-prized feature of the homes of the well-to-do in times past-are becoming a hot item in new construction and a selling point in older homes as well. "They are definitely growing in popularity," said Kira McCarron, vice president of marketing for Toll Bros., the luxury home builder in Huntingdon Valley, which offers a 30-foot-by-15-foot conservatory as an option. "It's great flex space for any and all purposes." Popular...and expensive. The price of a custom-built conservatory can range from $20,000 to $300,000, builders and manufacturers say. How does a conservatory differ from a sunroom, which is the better-known description of this kind of architectural feature? Classical architectural design elements, said Mark Barocco, president of Renaissance Conservatories in Lancaster, a manufacturer of conservatories. 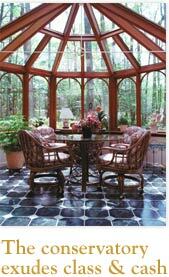 "The word conservatory is usually used to refer to a more traditional sunroom design," Barocco said. "It conjures up an image of Europe, where sunrooms, conservatories and orangeries had a functional value as well as an aesthetic one. "There are several levels of customers for conservatories," Barocco said. "We look at ourselves as producing a world-class product that appeals to people with a sense of value." The traditional definition of a conservatory-those that began appearing in France and England in the 18th century-is a place to display ornamental plants with showy leaves, stems and flowers. According to D. G. Hessayon, the British greenhouse expert and author, the conservatory differs from the greenhouse in that the chief consideration of the former is "the well-being and comfort of people," while that of the latter is "the well-being and comfort of plants." "In most but not all cases the structure is attached to the house," Hessayon wrote in The Greenhouse Expert (Transworld Publishers, 1994). In most cases, "the structure is decorative and with external ornamentation. Some form of decorative flooring is present, ranging from simple matting to marble tiles." Whatever you call them, these rooms or structures involve lots of glass, which is why they all qualify as sunrooms. The glass is used to control solar radiation-energy from the sun-by reducing or increasing the amount of heat that the sunlight brings into a room at a given time. Facing the gloom of another winter, Northerners would want a structure that would catch as much of the sun's light and heat as possible. However, in the Southwest, where the sun shines intensely much of the year, builders and architects need to establish limits. They do so by using coatings or tintings that lower a window's shading coefficient, which is a measure of the ability of a window or skylight to transmit solar heat through a one-eighth-inch clear, double-strength, single-pane glass. The lower a window's shading coefficient, the less solar heat it transmits and the greater its shading ability. There are materials, such as the trademark Solarcool bronze used by Ventura Sunrooms, a San Buenaventura, Calif., manufacturer, that help keep a sunroom cooler in hot climates. Solarcool has a light-and-heat-reflective coating that is fused permanently to the outside surface of the glass. This coating reduces the sunlight entering the room by 75 percent, and reflects much of the infrared heat radiating from the ground or nearby buildings. Without dwelling on manufacturers' variations, modern sunrooms are most often described as solariums, patio enclosures, and garden rooms. A solarium-the term is often used interchangeably with conservatory-typically has four glass walls and a solid fourth wall. Where the traditional conservatory and the modern sunroom are almost identical in function is in the garden room, which, according to Hessayon, is both extra living area and home for plants. When the living area is of primary importance, however, it is a garden room. When the plants predominate, it is a conservatory. Thus, a conservatory is first and foremost an indoor botanical garden. When wealthy Frenchmen began constructing them in the 1700s, the chief purpose was protection for orange, lemon and lime trees during the winter. "They literally dug up all of the orange trees in the gardens and transplanted them indoors to protect them in the winter," Barocco said. "Then they would replant them out of doors in the spring." These "orangeries" typically were freestanding structures away from the house. In the 19th century, they were often made of cast iron and glass. The Dorrance H. Hamilton Fernery at the Morris Arboretum in Chestnut Hill is an example of this kind of orangery construction, even though ferns do not need the kind of headroom that citrus trees require. There are a number of Victorian and Edwardian-era conservatories in Chestnut Hill and other older and wealthier neighborhoods in the city and its Pennsylvania suburbs. And while some luxury new-home builders-notably Toll and the David Cutler Group of Blue Bell-are offering conservatories as options, the majority of conservatories under construction these days are additions to existing homes. "About 60 percent of our business involves remodeling," said Barocco. Most of the designs of modern-day conservatories are variations on familiar traditional styles-Georgian, Victorian, Edwardian and Gothic. Renaissance's Cape May model is based on the Victorian architecture Barocco saw on trips to that Jersey shore community, and other models " have visual aspects that relate to areas of the country that we build for-Maryland and Virginia, for example. 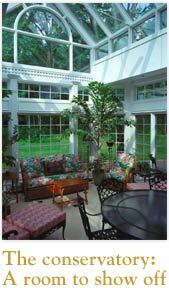 The conservatories are built in sections by apprentice-trained craftsmen to "ensure quality control," Barocco said. Because his conservatories are factory-built and then assembled on-site, Barocco can customize just about every component. "We generate our own drawings," Barocco said. "We make our own millwork, if the customer wants an 84 1/2-inch door instead of an 80-inch door, they can have it. When we price a room, we break it down physically into each of its components. If the room increases one foot in height, we can price it without any guesswork." "The basic Cape May Model, 14 feet by 14 feet, costs about $50,000-70,000," Barocco said. A lot of U.S. firms manufacture sunrooms, but few companies in this country specialize in conservatories. "Most conservatory builders are in England," says Barocco, "and they are at a clear disadvantage when it comes to delivering service."